The fifth largest city in Oregon, Hillsboro is known for being a part of the Silicon Forest, home to Intel, the Hillsboro Hops, and many other thriving businesses. After HomeArea.com released it’s data regarding affordability, it may also claim the Most Affordable City in Oregon With The Most Affordable Homes. This result was reached when HomeArea.com took data released from the Census Bureau’s American Community Survey for all cities in Oregon with a population of 60,000 or more, and used it to compare local home prices with local incomes. They then asked the question,”How many years would it take for the median income to pay off the median home price?” The results? Hillsboro came in at the most affordable, followed by Salem in second, and Beaverton in third. The positive results for Hillsboro didn’t end there. HomeArea.com also looked into many other criteria, such as Cities in Oregon Better to Buy Than Rent, Lowest Poverty Cities in Oregon, Highest Household Income Cities in Oregon, Lowest Unemployment Rate, Highest Percent in the Labor Force, Fastest Commute Cities, and more. Surprisingly, Hillsboro did well in the majority of these categories. When it comes to cities in Oregon that are better to rent than buy, the data placed Hillsboro in the number one position, with a price to rent ratio of 21.7. In second place was Salem, followed by Gresham in third place. Hillsboro also came in first place in regards to cities in Oregon with the lowest poverty rate, with a rate of 5%. Hillsboro’s poverty rate is slightly lower than second place Bend’s 7.8% rate, and slightly over 3% lower than third place Beaverton’s 8.8% poverty rate. Hillsboro’s poverty rate declined 51.9%, reducing the city from 10.4% to the current 5%. Other categories Hillsboro came in first place in include the highest household income cities in Oregon, with an income of $83,992, blowing away second place Beaverton’s $71,979, and third place Bend’s $66,455. Portland came in fourth place, with a household income of $66,187. HIllsboro also topped the list of cities with the highest percentage in the labor force, at 74.5%, coming in slightly above Beaverton’s 71.6% and Portland’s 70.8%. Categories the residents of Hillsboro were beat out on include the lowest unemployment rate. Beaverton came in first place in that category with a 3.5% unemployment rate. Beaverton was followed by Bend at 3.9%, and then Portland at 4.7%. Hillsboro ended up in fourth place, with an unemployment rate of 4.8%. Hillsboro took second place behind Salem in the fastest commute cities (yet beat out Beaverton and Portland) with an average travel time of 24.2 minutes. In the data set of high school grad rates, Hillsboro came in third place at 91.6%, falling to Eugene in first place with a 94.4% grad rate, and Portland at 92.7%. One set of data that I found interesting regarding Hillsboro was the one that discussed the highest public transit usage. Not surprisingly, Hillsboro came in third at 8.6%, behind Portland in first place (shocker) with 12.6%, and Gresham at 8.8%. What was interesting to me about this wasn’t the order in which Hillsboro placed, but the percentage increase from where it had been previously. 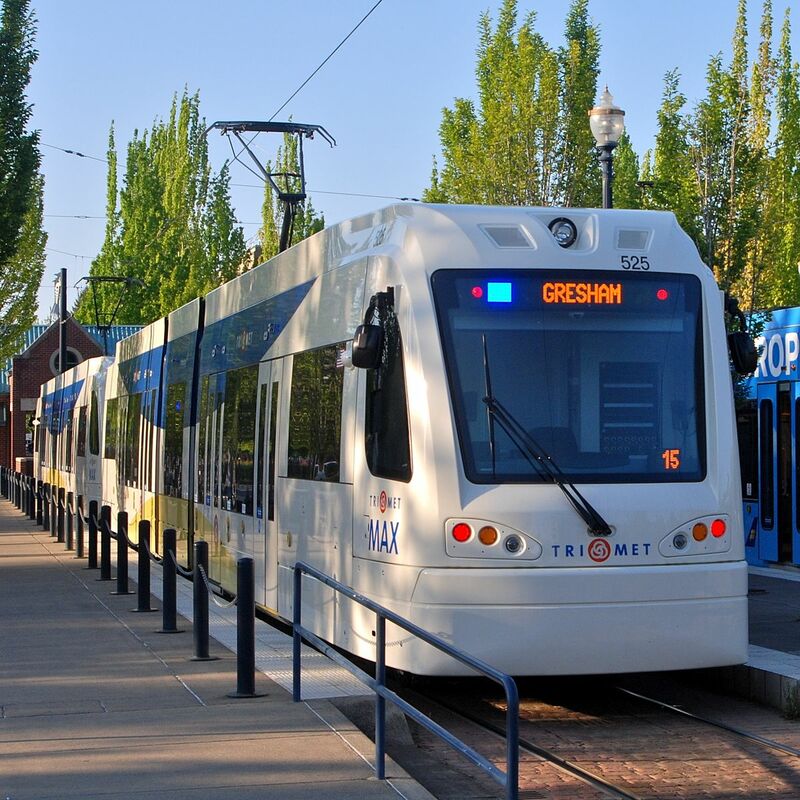 Hillsboro’s public transit usage skyrocketed from 4.2% to 8.6%, an increase of 103%. What do you think caused such a high jump in transit usage? There are a lot of numbers here, much to unpack and process. I can’t claim to know why Hillsboro performed so well in each of these data sets, but I would be interested to compare them to the goals and projects of the City of Hillsboro to see what they have been striving to improve on. Perhaps this is a result of those projects. What I do know is that Hillsboro is continuing to grow in residents, housing, and employment, offering an abundance of diversity and opportunity to its citizens. What are your theories regarding the success in each category? When you think of affordable housing is Hillsboro a city that comes to top of mind? Do you believe these results will cause more people to move to Hillsboro compared to other cities in Oregon?